I am Principal of a K-12 school. One of my concerns was how the presentation would be effective to the lower elementary and the senior high. I was pleasantly surprised! Andy adjusted his presentation to be appropriate for all the students. The elementary students left the presentation laughing and doing the dance actions, which was pretty entertaining, but I also noticed the same actions with the high school students, including the grade 11 class that I taught the next class! There was also a huge benefit in creating positive attitudes and taking responsibility for actions through the discussions that Andy had with the students. Caring and participation are key elements to success in any organization. Students have no problem caring! They care a lot about the "stars" on their favourite teams or singing their favourite songs. Andy encourages students to bring that care to school! For only a few years the "stars" of your school teams, events and stages share something incredible with you! They go to your school! They are your friends and schoolmates! "How are you going to care?" is Andy's challenge to your students. Care comes in many forms: being attentive in class, going to the play, attending spirit events or bringing in a can for the food drive. Listening … to the teacher, to your parents, to the boss, to your friends! Participating … dress up for spirit days, cheer at a game, put your hand up in class. Showing UP … to events, to practice, to work, to class! 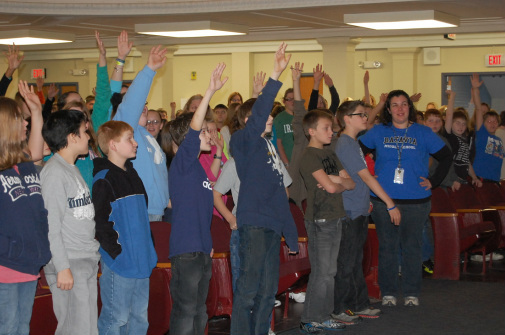 For a K-8 school, Andy designs his visit to have two assemblies: one for grades 1-4 and one for grades 5-8. Andy's high energy, comedy, and audience participation keep students of all ages engaged. "We really appreciated your work at last week's assemblies! It was a great way for us to end the first week of school on a high note. Speaking with a lot of students and staff, they really enjoyed your humour and personal stories......best of all, the "key messages" seemed to stick with them. The "Share Your Care " theme appears to be gaining momentum around the school and we are strongly considering using it as our theme for the year. (last year's catch phrase was, "What makes a great school.....the people inside!") A couple of staff members even commented that you were the best speaker that we've had in years." Andy's powerful Get Your Hand Up keynote will entertain and inspire your students by encouraging them to bring back their grade two enthusiasm and "get your hand up" - participate in class, in school, and in life! In this presentation, Andy encourages students to overcome their fear of failing. He urges them to ask questions, answer the teacher, and try their best in the classroom. He inspires his audiences to volunteer and get involved in all of the great activities, both at school and in life. Throughout his presentation, Andy tells students to take advantage of their time in school both to LEARN and to have FUN. I want to thank you again for the incredibly entertaining and powerful talk you did today. As you noticed I was laughing so hard that it brought me to tears of laughter. Your charisma is an inspiration, your words were so relatable to kids and you truly have a gift. What a model you are to our students.Reactions from staff and students (even our grades 7 & 8 students) were nothing but positive and in fact many raved about your presentation. I wish I could hear you speak again very soon!" Anita McQuarrie, Teacher Advisor for Character Education, Bogart & Clearmeadow Elementary, Newmarket, Ontario. ​“Care is contagious, but as a leader it must start with ME! How do I get my care out there?” This session will answer that question! This workshop is an excellent follow-up to Andy's assembly as it empowers leaders to continue with the message that he delivers to the student body. This one hour to two hour workshop (flexible to your schedule) offers youth leaders helpful insight on effectively communicating their care for the school to the students and staff. The presentation draw's on Andy's years of experience as a student leader and as a speaker traveling the continent. Andy is the teaching profession’s #1 fan. This is because of the difference teachers have made in his life. It also helps that he married a high school French teacher! This program is an empowering reminder to your staff on the difference they make with youth. Andy is very popular with K to grade 12 schools on the Canadian prairies and other remote communities. Principals appreciate that Andy can perform two assemblies to reach all of the students. The first assembly would be for grades 1 to 5/6, the second for grades 6/7 to grade 12.